I was inspired by a recipe I found on All Recipes for banana bread and this is my rendition. I've made plenty of banana bread recipes in the past but they came out far too dry. Two ways to fix this: Find a better recipe and /or use mini loaf pans! In a small bowl, mix together the flour, baking soda and salt. In a mixing bowl or with hand mixer, cream together softened butter and coconut sugar. Add eggs and mix thoroughly. Add bananas and stir thoroughly. Batter will be somewhat watery looking. This is a good thing. If it’s not, you probably didn’t use enough bananas. At last, fold in flour mixture until just moistened. Spray 4 mini loaf pans with Pam and pour batter evenly into all pans. Bake for 25-30 minutes or until nice brown color and toothpick comes out clean. You want it to be somewhat spongy on top. Do not over bake. Bread will have pockets of banana throughout. Cool on wire racks for 10 minutes. Remove from pans. Continue to cool for 10 minutes then wrap in foil and store in air tight container. Slice and serve warm, if desired. Great recipe. When you get a chance you should try yogurt in your banana bread recipe. It keeps it moist too. Great idea Elisa! I've never used yogurt in a recipe. What ingredient does it substitute and would the equivalent be the same? I agree Tanyetta! 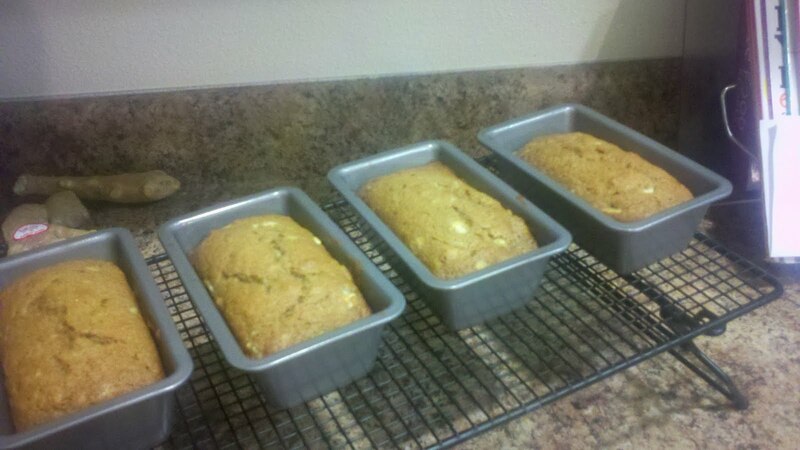 Sometimes it's tough waiting for those bananas to over ripen so you can bake some bread.